Thanks, Tom! And you’re a Bills fan, so, makes perfect sense! :)) Always appreciate your feedback. Glad you captured both, Laura. I actually prefer the pencil one this time. Thanks, Kerfe! I think it may be my favorite too. Nice to get so many generous comments; really helps me to see. Fantastic – Keep up the great work! I’m enjoying your challenge! Thanks, Someone! I’m so glad you’re enjoying! Thanks for letting me know; I appreciate that! I like both Laura, but the red just symbolizes the strength of the cardinal – his long standing call out to nature. Beautiful work, they have a minimalist feel to them, but give the viewer total appreciation of the species. Congrats on keeping up with the challenge! They are both very good. Your drawing skills are so good! Keep going! Thanks so much, Carmel! Drawing every day is huge. I think if I stopped for awhile and went back…..don’t even wanna think about it. I’m so glad you stopped by. Always appreciate your encouragement! Have a great weekend! I like both and I love the color. Thanks so much, Kirk! I’m so glad to see this! I’ll go with black and white, but maybe I’m biased that way! I find looking at the line drawing sort of suggests the colour in my head (though that probably only works if you’ve seen a cardinal before) while in the coloured one the details do get lost a little. They’re both lovely though! Thanks, Iris! Always interesting to get everyone’s thoughts! I appreciate your comment and reasoning. Thanks, Jill! I had a feeling color would be your vote! Wow, I didn’t know that. Birds are so amazing. I’m enjoying Kathy’s photos so much, I could almost make this a 100 Bird Face Challenge lol! You’re so right – there are so many, and all so beautiful and unique. 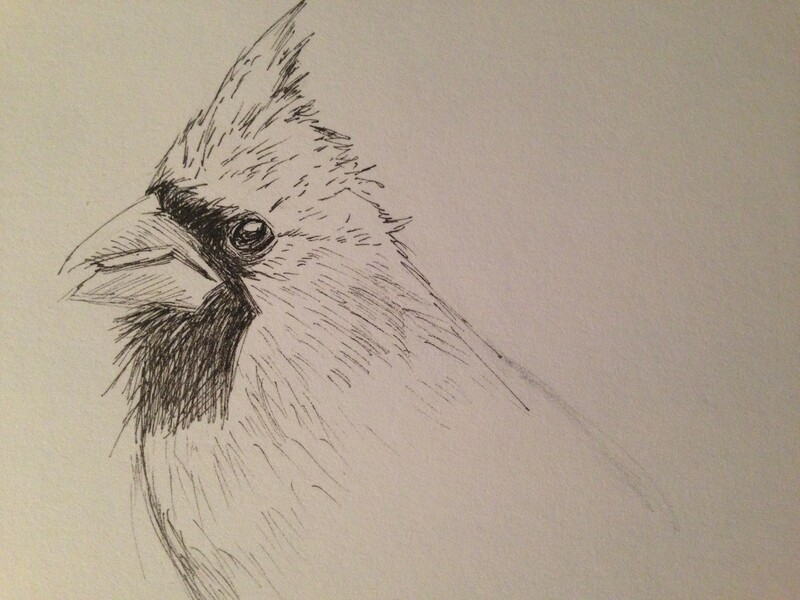 As artists, we could spend a lifetime on birds alone! Right back atcha, ColorQueen! Oh Jill, you’d so laugh at the mixed media I’ve been trying lately. Very sad indeed, lol. It’s so nice we all have different strengths, so we can share all of our different kinds of artwork with each other, and with the world. While your pen drawing looks beautiful, I think that compared to the colored piece, it looks a little unfinished. It is still wonderful, though! Thanks, Teresa! It’s so interesting to hear the different viewpoints on this! And they all make sense. Oh, the Libra in me is struggling lol. I like the one with the color very much. Happy weekend! Thanks so much, Laura! Have a wonderful weekend yourself! What a quandary! I’m loathed to discount one for the other as both have their charms, but if forced I’d probably tend more toward the colour – that red is awesome! Thanks so much, Jacob! I’m so glad you like the color! Those Inktense pencils are wonderful things. I love both, but I’m leaning towards red-filled! I’m late, but think it’s brilliant!!! I knew straight-away it was a Cardinal a could read through your text to get to the next image fast enough! It’s brilliant, wonderful, and very, very life like! You have no idea how much I’ve longed to see and photograph this bird. How I long to see one male with my own two eyes! We don’t have them at all, EVER where I live. I love the profile you chose to draw, the color, and that highlight in its eye! I hope one day I can photograph one this good. WOW! Your drawing is…WOW!, Okay, sometimes there’s just no word better than WOW! I’m just sayin’! LOL Thanks so much, Deborah! 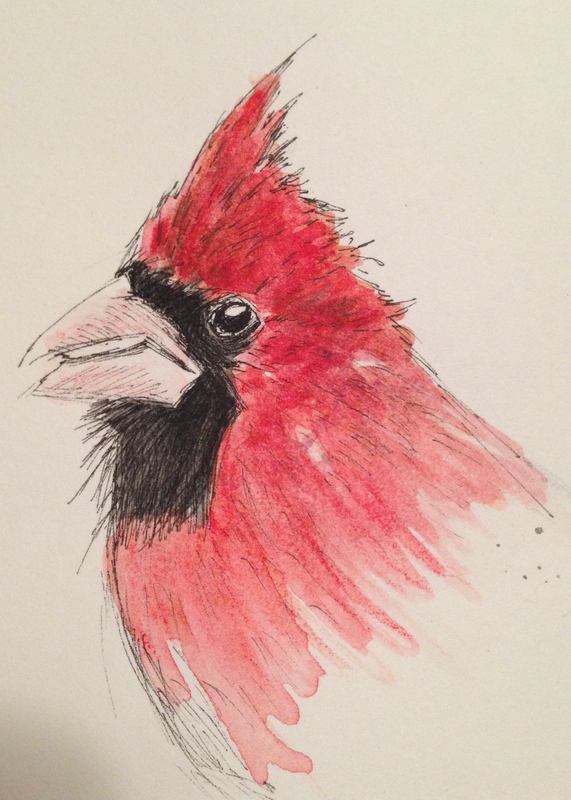 I hope you get to see a cardinal in person one day. They really are majestic birds. So glad you enjoyed the drawing/painting! Thanks. Denis! Was a beautiful photo, which really helps! I can’t make up my mind! they are both lovely. Thanks. I think in future when I plan to paint, I’ll use less line work. I probably should have left this one unpainted with so many lines. It is all a learning experience!